All digital camcorders have built-in microphones, and most of them record audio adequately. After spending hundreds if not thousands of dollars for a high-tech digital camcorder, you may be frustrated by the so-so quality of the audio recorded by the built-in microphone. The problem is that the camcorder’s mic is prone to pick up a lot of noise you don’t want, while not recording enough of the audio you actually want. Unwanted noise includes wind roar, people chatting next to or behind the camera, and even the camcorder’s own tape drive. Use a high-quality accessory microphone. Record audio using a separate recorder. If you want to connect a better microphone to your camcorder, the best place to start is with your camcorder’s manufacturer — you’ll need a really long cable. (Just kidding.) Usually accessory microphones are available from the manufacturer. These accessory units make use of connections, accessory shoes, and other features on your camcorder. One type of special microphone you may want to use is a lavalier microphone — a tiny unit that usually clips to a subject’s clothing to pick up his or her voice. You often see lavalier mics clipped to the lapels of TV newscasters. Some lavalier units are designed to fit inside clothing or costumes, though some practice and special shielding may be required to eliminate rubbing noises. You might also consider a hand-held mic. These can be either held by or close to your subject, mounted to a boom (make your own out of a broom handle and duct tape! ), or suspended over your subject. Suspending a microphone overhead prevents unwanted noise caused by breathing, rustling clothes, or simply bumping the microphone stand. Just make sure that whoever holds the microphone boom doesn’t bump anyone in the head! Microphones are generally defined by the directional pattern in which they pick up sound. The three basic categories are cardioid (which has a heart-shaped pattern), omnidirectional (which picks up sound from all directions), and bidirectional (which picks up sound from the sides). Figure 1 illustrates these patterns. 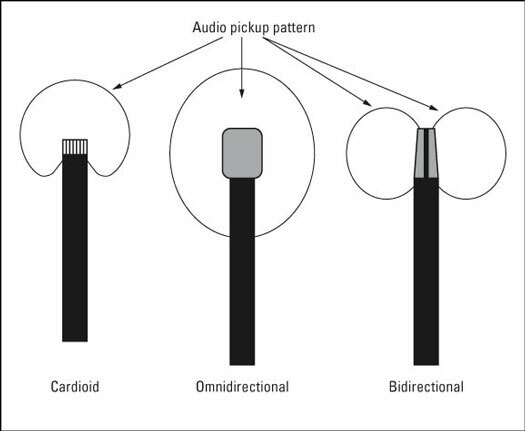 Figure 1: Microphones are defined by how they pick up sound. A good place to look for high-quality microphones is at a musician’s supply store. Just make sure that the connectors and frequency range are compatible with your camcorder or other recording device (check the camcorder’s documentation). Finally, the Internet is always a good resource as well. One good resource is Shure Incorporated. Shure sells microphones and other audio products, and the Web site is an excellent resource for general information about choosing and using microphones. Separate sound recorders give you more flexibility, especially if you just want to record audio in a certain location but not video. Many professionals use DAT (digital audio tape) recorders to record audio, but DAT recorders typically cost hundreds or (more likely) thousands of dollars. Digital voice recorders are also available, but the amount of audio they can record is often limited by whatever storage is built in to the unit. For a good balance of quality and affordability, some of the newer MiniDisc recorders are good choices.